I usually set these little gems on the end of my table at the farmers' market to get the conversation going. What are these adorable, delicate little canary yellow gems wrapped in a Chinese lantern-esk paper? A husk cherry! These also go by ground cherry, cape gooseberry and in French (which is my favorite), Amour en Cage, which means "caged love." 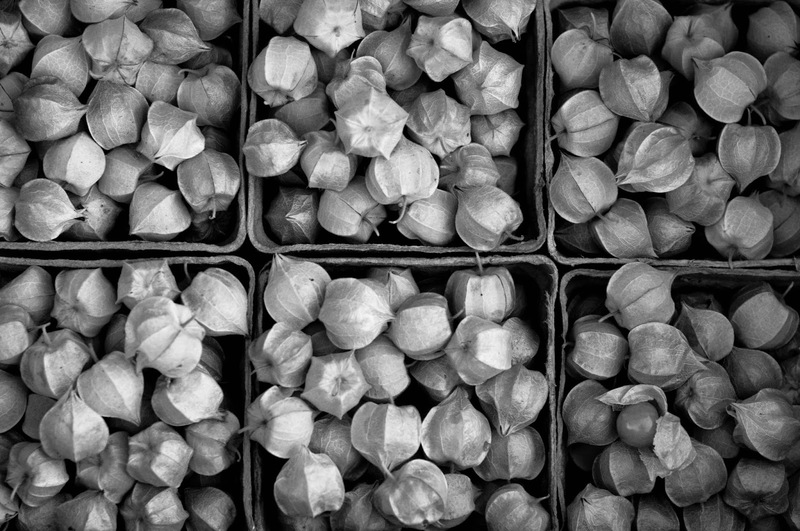 They are closely related to a tomatillo (as if you couldn't already guess that) and have their roots in South America. In other parts of the world like Austraila and New Zealand they are often made into jams or pies. They have a very unique taste...like a tomato but sweeter. More citrus. More pineapple. More apricot. Kind of....butterscotch. 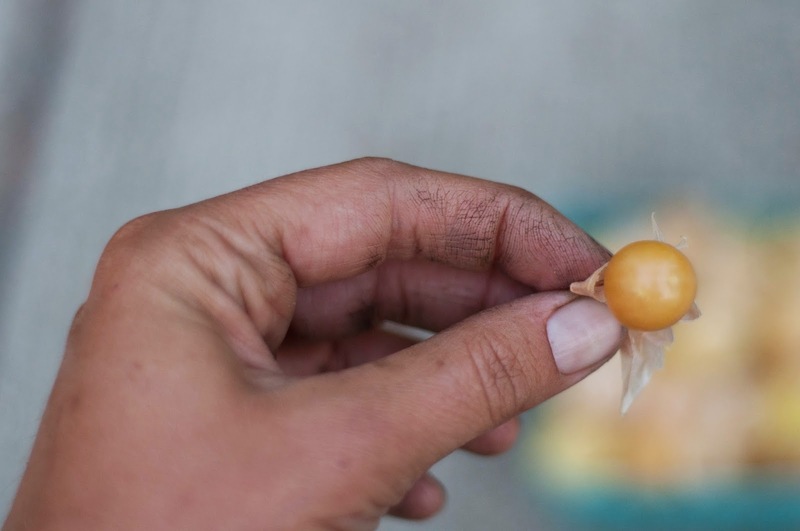 They grow on a low sprawling plant that produces a ton of little husk cherries. They start out green and then slowly dry as the fruit ripens. 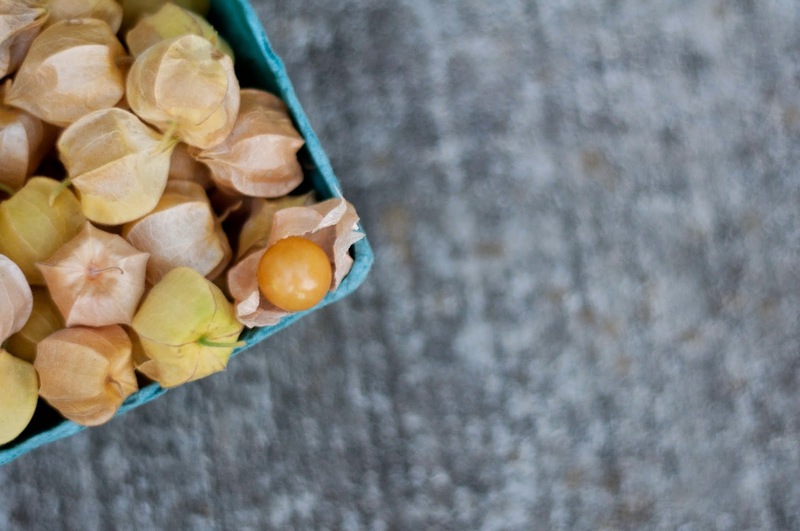 They get the name "ground cherry" because you know they're ripe when they fall off the vine. We grew ours on black plastic...I didn't really like the idea of picking up my food and the food of my customers off the ground. The plastic seems to be working. Husk cherries definitely needed a post Rose, great idea again! They are pretty unknown to most folks. I had them for first time last year and to me, they tasted very much like a corn muffin. That might sound weird, but it was real similar. So, are you doing any season extension stuff with poly row covers and greens.........? Corn muffins?! I love it! I get really interesting reactions from those little husk cherries but I think Corn muffins is the winner so far! As far as season extension...It is on my mind but not for this year. I need a little more time to plan and would like to work with someone who is doing it before diving in. I was inspired by a great speaker at a NOFA conference I went to...loved her and her ideas. She actually only does a winter CSA which I find genius. It was even like warm corn muffins fresh outta the oven bc I tasted them right after they were picked on one hot summer afternoon. hahaaaa for real. Do you remember who that farmer was or her farm?? Eliot Coleman is the man----- I've been reading up on him a ton. He really paved the way for winter salad production, I really think that you could kill it with winter greens, NO ONE IS DOING IT. you win.